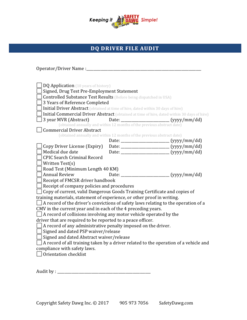 CDL Truck Driver Files What is Needed, How to Audit - Safety Dawg Inc.
How do you know that your truck driver files are going to meet DOT state provincial requirements? Yes, you're listening to a Canadian Safety Consultant, however, because so many of my trucks go to the United States, I must know about the Federal Motor Carrier Safety Regulations. This video is going to answer some critical questions for all carriers in North America about what needs to be in a driver file to be compliant with the USDOT, and often you also want to be compliant not with, there's no compliance but when you get audited by a lawyer after a severe crash, will your files help you to refute or defend negligent hiring and negligent entrustment because that's what you're going to get sued for. Let's dig into it, don't forget to like and subscribe to this channel. By liking and subscribing, it gives me encouragement to continue to make these videos. I want to tell you that this is the first video in the series, I'm going to go through my checklist and then I'm going to dive deep in further videos into most of the items on this checklist. I want you to understand for instance when I say driver files, we're gonna dive deep into driver files that's going to be the next video. So like and subscribe to the Safety Dawg channel. I appreciate it so much. What needs to be in a driver file? Let's look at the checklist and if you want, stop this video, download the checklist, the link is below so you can follow along. I'm giving you this checklist for free. First of all, you need to have a DQ application or a driver application form, and best practice says it goes back 10 years USDOT, there are circumstances that it says you must go back 10 years. We're going to cover that in the following video. Next, you need a signed drug pre-employment statement. As we know to drive a truck in the United States, you must be part of the drug testing consortium, and you need to start that off with a pre-employment. You must have the test results. Sorry, you must have the negative test results in hand before the driver starts to drive. For a Canadian company, you must have the test results in hand before that driver enters the United States. Controlled substance test results. So, before being dispatched to the United States, we want you to have that in hand, three years of references completed. This is a USDOT requirement that you confirm or do what they call or what is called a driver history check and that is for three years. Every other place it is the best practice, your insurance company for sure wants you to confirm the last three years of that truck drivers employment. Initial driver abstracts in Canada, we call them driver abstracts. Some jurisdictions call them motor vehicle records or MVRs. You need to have the initial MVR, I urge you to stamp that or market as an original, you never throw it out if a driver is with you for years and years you may get many of these MVRs, and I don't want you to throw out the initial one because that can help refute negligent hiring, negligent entrustment. The initial driver, commercial driver abstract in several jurisdictions, we have commercial driver abstracts in the States, we have PSP, so you want to make sure that you carry your initial MVRs. Again, never throw those out. However PSP you read the contract and do what the contract of the PSP says. We're going to dive deep into that in another video. Three-year MVR abstract, you're going to get this every 12 months so when I'm going through a driver file, I want to make sure that there is a current or recent MVR or driver abstract within the last 12 months. You need to get one every 12 months. Same with a commercial driver abstract, this is not PSP, don't be confused. PSP you can only drop pull at once, pre-employment screening so pre before employment, but if your jurisdiction has commercial abstracts you need to be getting those on a regular basis at least, at least every 12 months. A current copy of the driver's license and the expiry, I put the dates on my checklist so that you can create an expiry list. There are many things that you need to be tracking to make sure that your drivers are current and that is one of them. Medical due date, another thing to be tracking. Your drivers have to go for medicals, you don't want them operating your truck with an expired medical because their class of license is no longer valid, all right? In Canada, we do criminal record searches. In the United States, of course, you do searches to see if the driver has any felonies. I really encourage you, and the insurance industry invites you to do your own road test. You're about to give this guy a truck, a trailer, a cargo, your company's reputation and of course you're working for a shipper, and you want to get the load there to the receiver on time, so make sure you do the road test. Annual reviews, this is a requirement in most jurisdictions, you've got to do annual reviews in the DOT. It is specific, you must do annual reviews to make sure that driver still meets your company policies. We see that the FMCSAs driver handbook if you give those out, the driver should be signing, the receipt goes into the driver file and of course, the driver's sign saying that he's going to familiarize himself with the regulations. All drivers should know the regulations that they're operating under, and you can prove that they do know what several ways and one of them is the previously mentioned test. We see that the company policies and procedures, everybody should have a company policy and procedure book for the drivers and they should be signing for that. I even go one step further and suggest perhaps a quiz for that, but that's another thing. A copy of the current dangerous goods certificate of training. In Canada, we call it dangerous goods. In the United States, you refer to it as HAZMAT. In Canada, we do it a little a bit differently, it's up to the carrier every three years to make sure their driver is carrying a valid license, so the training is good for three years in Canada. A record of driver convictions of safety law, so all the tickets we need to keep this up-to-date. A record of the collisions, of course, that is on the application form and then ongoing, we need to keep that up-to-date. A record of any administrative penalties, so any license suspensions. A signed and dated PSP waiver, if the driver is going to the states and if you are participating in the pre-employment screening program. Before you pull it, you need to have that signed waiver from the driver, please. A signed and dated abstract waiver, this is what I refer to it in Canada. In the United States, you might call it an MVR waiver. It's basically a form that gives you permission to pull the driver record from either the state or the province. A record of all training, as you continuously train most companies and in most jurisdictions, the state or the province are asking you to do initial hiring training. So I call that part of the orientation, and then they also want you to do ongoing training, continue to train the driver to throw out their history with you, and of course you need to document that or if you don't record it, the training really you don't have any proof that it ever took place. Then the orientation checklist, what policies and procedures did you go over very carefully with the new driver, with that new hire to make sure that he understood what it is that you wanted from him? Very quickly, that's my driver checklist. The link is down below. Click and like this video, subscribe to the Safety Dawg channel. Subscribe to this playlist so that you are notified when I add the next driver video to it, and it will be about driver application forms, common mistakes that are made on the common or on the driver application form. For now, Safety Dawg's out.